Amendments to the Employment Relations Act are due to come into law on 6 March next year. Over the last year many of us have been trying to stop the changes. Thousand of nurses, midwives, caregivers and kaimahi hauora made submissions to the Select Committee considering the amendments – and NZNO is really proud that every single one of those submissions were written by members, no tick-box form submissions for us! Thousands of us protested, attended rallies, participated in the “Give us a break” workplace actions, talked to our families and friends about the issues, used social media and much more. We did it to stand up for decent working rights for nurses, health workers and the rights of all workers in Aotearoa. But one thing the legislation doesn’t do is give employers power – what it’s giving them is control. It’s control of the ugliest kind. The kind of control that can legally demand employees work with no breaks or strip loyal staff of paid hours of work and pit employees against one another. What we have is power! Power is about strength, sharing that strength with others and growing stronger as a result. It’s about standing beside our colleagues, our whānau, and our community so we all have the strength to stand together for what is right and just. As a fledgling union in the 1990s when the Employment Contracts Act was introduced – our members and other union members lost significant pay and conditions. Over the last decade and a half we have demonstrated what real power is. We have worked together to rebuild national and multi-employer collective agreements. We took up the fight for pay equity through the Fair Pay campaign. We supported settlements that extended fair pay across the primary health, aged care and private hospital sectors. We stand with Kristine Bartlett and the Service and Food Workers Union Ngā Ringa Tota in support of pay equity for caregivers. Our engagement and participation builds real power – our strength in standing together can’t be taken away by the stroke of a pen or the drying ink on legislation. 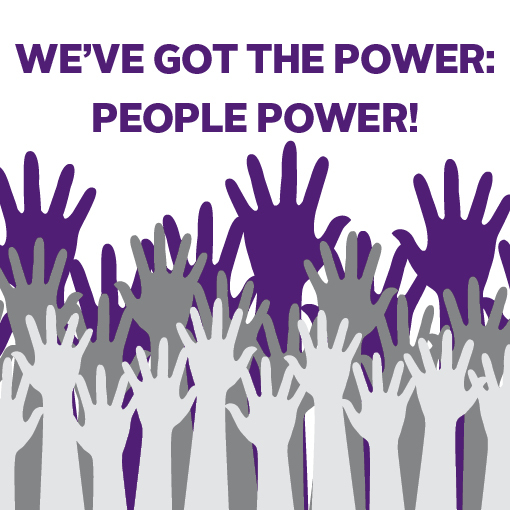 Governments may make laws that give employers more control; but we hold the power – people power! Tags: advocacy, collective action, control, equal pay, ERA, fair pay, power | Permalink.